We can hardly blame Alfa Romeo for focusing more on sedans and crossovers these days over sports cars. But looking at this design study, we hope it finds room in its lineup (and budget) for a low-slung replacement for the aging 4C. What we're looking at here is called the LEA – shorthand fo Linea Emozione Aerodinamica. It's the work of Italian designer Luigi Memola, head of London-based EPTA Design, who was kind enough to share his design with us on Behance. And we think it strikes just the right balance of future and retro. 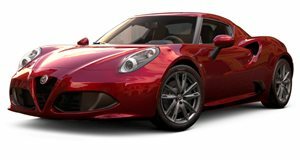 The overall form draws clear reference to Alfa sports cars and racers of old, with its swept-back and low roofline, long hood, low-mounted shield grille, pseudo-Kamm tail, fender-mounted wing mirror, and horizontal along down its profile. But in a modern twist, the lower half is carbon fiber (not black sheetmetal), the wing "mirrors” house cameras (instead of reflective glass), and the head and tail lamps make conceptual use of the latest LED technology. We particularly dig the projected ring lights, the deep aero outlet in the hood, the old-school slated engine cover, and the wraparound windscreen blending straight into the side glass. In any event, a concept like Memola's isn't about specifications. It's about design aesthetics. And while we might take a different approach with the nose treatment, we think it looks pretty good overall, don't you?